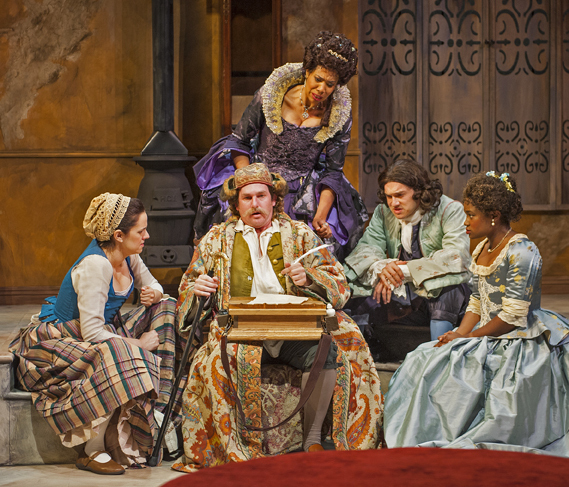 Greed isn't simply good in David Ives' The Heir Apparent at Berkeley's Aurora Theatre. As a vehicle for generating grins, giggles and explosive laughs, it's great. So are its crude gags relating to farts, diarrhea, erections and other bodily functions that don't often draw attention in polite conversation. Ives concocted the tale around the skeleton of the 1708 French farce Le Légataire universel by Jean-François Regnard, a minimally known successor to Molière. 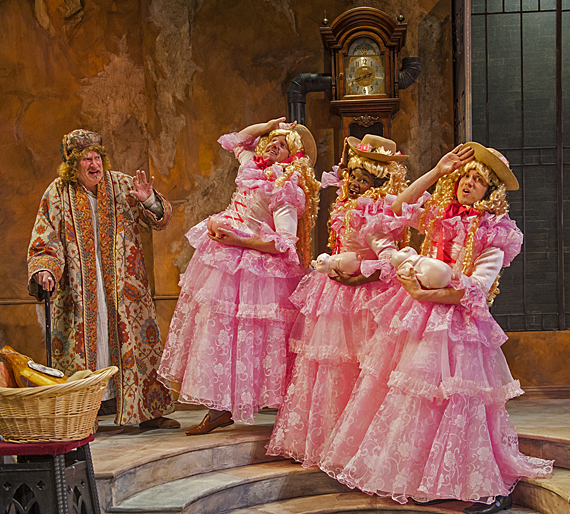 Like so much comedy of that era, the characters and motivations and relationships are essentially familiar, leaving the task of holding an audience in stitches to the artistry of playwright, director and performers. Aurora's assemblage of those elements could hardly be better. Ives translation/adaptation retains the original's form of rhymed couplets, producing torrents of verbal silliness that the cast of seven handles with unaffected grace. The literary technique and the play's tone emerge with roar-generating clarity in an exchange in the show's first minute. The speakers are two servants, discussing an ailing miser's precarious health. Lisette: "He only lived thanks these brews I craft." Crispin: "Your soup-slash-laxative? That healing draft?" Lisette: "I irrigated him both fore and aft." Lisette (Katie Rubin) works for the creaky skinflint Geronte (Julian López-Morillas); Crispin (Patrick Kelly Jones) toils for Geronte's nephew, a foppish simpleton who has visions of inheriting the old man's gold, which would pave his path to marriage. Just how much gold he possesses is never left in doubt. In repeated speeches and a hilarious choral anthem, we hear that it's a million francs. Although nephew Eraste (Kenny Toll) and innocent fiancee Isabelle (Khalia Davis) are eager to trek to the altar, they face two roadblocks. First comes Isabelle's imperious mother, Argante (Elizabeth Carter), who has laid down the law: no money, no wedding. A bit later there's another, weirder impediment: In one of his scattered bursts of energy, the ancient Geronte declares that he intends to take Isabelle as his bride, shocking all. Another day, another ploy: Imposter Patrick Kelly Jones signs Geronte's will, watched by (from left) Katie Rubin, Elizabeth Carter, Kenny Toll and Khalia Davis. Almost as an aside, Lisette and Crispin also have eyes on some small portion of the inheritance, as well as on each other, romantically. But the biggest obstacle to hopes and dreams is Geronte's will: He has none. That's the heart of the play, and the fuel for wacky creativity that turns a conventional 18th century tale into sizzling 21st century entertainment. Just about everyone takes a hand in ploys to coax Geronte into putting quill and ink on a document that will shape the destiny of his treasure. Some of the efforts are fairly routine if ditsy attempts at persuasion. Others are wildly over the top. Among the latter are a visit from a blustering phony nephew from America, toting a bolt-action blunderbuss and wearing a cap that may or may not be coonskin. Another involves the entreaties by one "niece" in frilly pink, followed by a second and then a third, surprising each other as well as Geronte. And still another involves an effort to impersonate Geronte, convincing a two-foot-six lawyer (Lawrence Radecker, on his knees in a black robe) to write a will that satisfies all. The schemes are goofy, but their goofiness adds up to low comedy at its howl-winning best. If unpredictability is the one quality that is thoroughly predictable in this "Heir Apparent," none of its twists arrive with as much surprise as its conclusion, which wraps up with happy couples all around and a suggestion that greed isn't necessarily good. I'll divulge no more, except to strongly suggest that you see for yourself, if you love to laugh. All the performance are top notch but López-Morillas' hunched, stumbly and very resilient Geronte and Jones's agile, inventive Crispin come close to stealing the show at times. Josh Costello provided the expert direction that turned a trifle into a hysterical treasure.